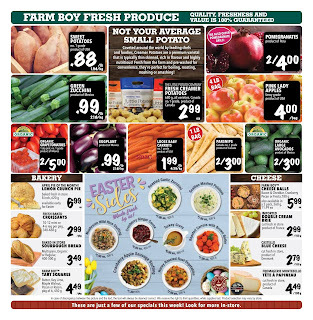 Farm Boy Canada Flyer March 29 – April 4, 2018 - Red Orange Or Yellow Sweet Bell Peppers $1.99/lb Sale Price Product of Ontario. $4.39/kg. Local. Fresh from Ontario. Farm Boy Fresh Turkey $2.49/lb Sale Price Grade A and grain fed for the very best quality and taste, 5 - 11 g. Local. $5.49/kg. 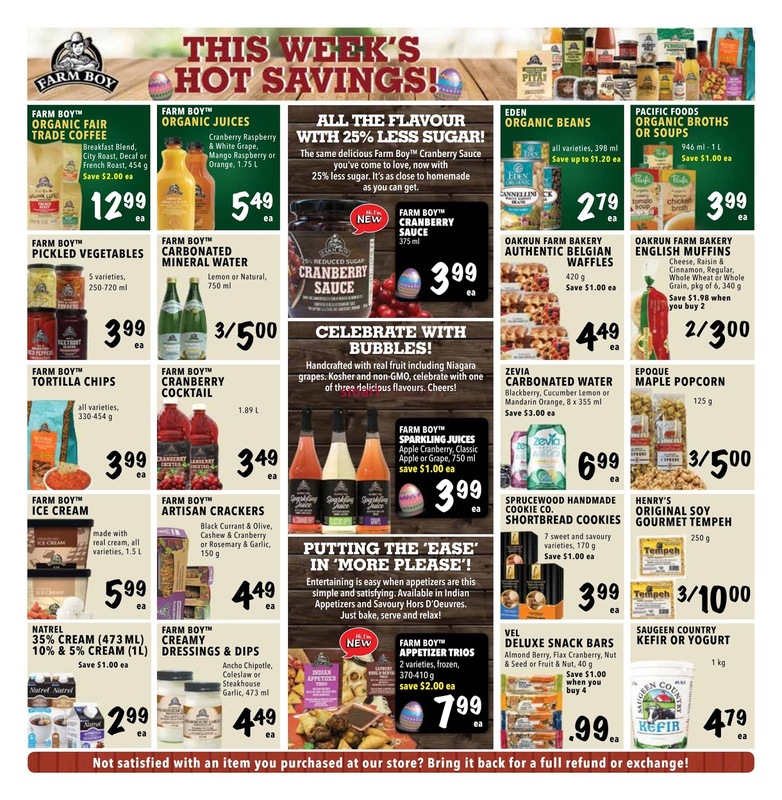 Farm Boy Canada Flyer Applewood Smoked Cheddar $2.99/100 g Sale Price $1.80 Savings Cut or sliced fresh in store. Product of England. Toppits Jumbo Cooked Shrimp Ring $12.99 Sale Price $4.00 Savings 19 - 22 shrimp per platter, 425 g, frozen, cocktail sauce included. Farm Boy Organic Fresh Organic Turkey $4.99/lb Sale Price Grade A, 5 - 7 kg, product of Canada. $11.00/kg. Flamingo Brand Fresh Turkey $1.99/lb Sale Price Grade A, grain fed, 3 - 7 kg, product of Canada. $4.39/kg. Wild Haddock Fillets $7.99/lb Sale Price $5.00 Savings Boneless, product of Norway / USA. $17.61/kg. Parsnips 2/$3.00 Sale Price Canada no.1 grade. Product of Canada. Loose Baby Carrots $1.99/lb Sale Price No.1 grade. Product of USA. $4.39/kg. 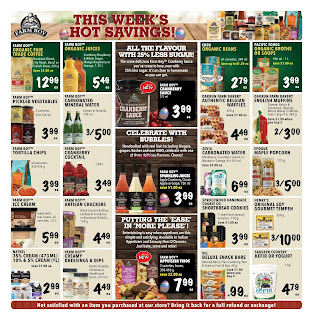 Farm Boy Organic Fair Trade Coffee $12.99 Sale Price $2.00 Savings Breakfast blend, city roast, decaf or french roast, 454 g. Farm Boy Pickled Vegetables $3.99 Sale Price 5 varieties, 250-720 ml. Oakrun Farm Bakery English Muffins 2/$3.00 Sale Price Cheese, raisin & cinnamon, regular, whole wheat or whole grain, pkg of 6, 340 g. Oakrun Farm Bakery Authentic Belgian Waffles $4.49 Sale Price $1.00 Savings 420 g. Pomegranates 2/$4.00 Sale Price Product of Peru. We also offer pomegranate. Pink Lady Apples $4.00/bag Sale Price Fancy grade. Product of USA. 4 lb bag. The Little Potato Company Fresh Creamer Potatoes $2.99 Sale Price 680 g. All varieties, Canada no.1 grade, product of Canada. Lemon Crunch Pie $6.99 Sale Price April Pie Of The Month. Baked fresh in store 8 inch, 620 g. Available early for easter. Farm Boy Tart Squares $4.49 Sale Price Butter, key lime, maple walnut, pecan or raisin, pkg of 6, 450 g. Sourdough Bread $3.49 Sale Price Baked in store. Multigrain, organic or regular, 400 - 500 g. Farm Boy Organic Large Avocados 2/$3.00 Sale Price Product of Mexico.